This post was written by our Operations and Development Associate, Maddie Doctor. It’s not easy to make a shipping container feel like a living room. But for four days at HUBweek, that’s just what Elisa H. Hamilton did. Her setup was simple: a slide viewer in the back, and one 8-foot long light table, colorful slides scattered atop like glittering confetti. People who approached the table did so first with apprehension that was soon overtaken by inquisition: Who are these women? How did you select them? What kind of dog is that? From October 12 to 15, I helped greet the innumerable visitors who stopped by the light table built as a centerpiece for Elisa H. Hamilton’s Slideshow, a project highlighting ten Boston-area women who photographed a week in their lives and created hour-long slide presentations based on those images. The slide talks were creative and compelling. But I’d like to talk about what happened at Slideshow when the projector wasn’t rolling. About the physical slides themselves, the light table, the loupes, the experience of looking through someone else’s eyes, and the power of a public art object to spark connection and elicit a sense of shared vulnerability between strangers. 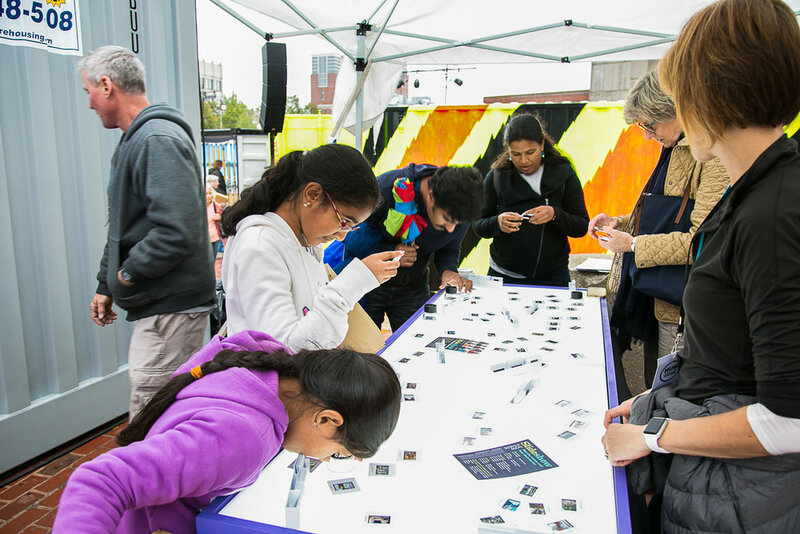 Even before they learned the premise of Elisa’s project, people were fascinated by the unexpected presence of this analog technology at a high-tech festival. I can’t tell you how many times I heard, “I haven’t seen slides in years!” Faces lit up as visitors recognized their own neighborhoods in the photos. Ignited by the presentations - or just passing by our glowing shipping container - people were absorbed by the table and the women’s slides. Elisa told me that one evening, she made a game of asking people to guess details about the women’s lives. Visitors would scramble to organize slides strewn across the light table. Categorized by photographer name, narrative details fell into place. Unorganized, narrative gave way to an equally engrossing experience of light, touch, and color. And visitors were eager to share their own memories of slide technology. We discussed relatives, teachers, parents and grandparents; family basements illuminated by the sunlight of Grecian shores; the bemusement of students whose professor still insisted on using an analog projector - in the 21st century! I particularly loved the teaching moments that arose at the table. Parents guided their children, who peered over the edge of the table and explored moments captured by the Slideshow women. “That’s ingenious!” proclaimed one boy when I showed him how to view the slides using the magnifying loupe. “Your grandparents have a basement full of these,” laughed his mother. Over the course of four days of these interactions, I grew to realize the impact of this project went beyond nostalgia. Seeing and touching the women’s slides allowed HUBweek visitors to meditate on the ways in which we value communication. Slideshow may wink at the irony of analog technology at a digital festival, but it ultimately makes a strong case for re-thinking the way we conceptualize innovation. Sometimes innovation looks like a shiny hydrogen car teetering impossibly atop a shipping container. But other times, it’s the connections we foster through a piece of public art encouraging us all to be a little more vulnerable.